Retirement News > Health > Articles > 3 Okinawan Secrets to a Long Life: 1) Ikigai 2) Moai 3) Hara Hachi Bu — Huh? Some might believe that the hokey pokey really is what it is all about. Yoga and mindfulness mavens chant “om” as a long and happy life mantra. Others sing super cali fragilistic expealidocious and, “if said loud enough,” will at least sound precocious. However, the residents of the Japanese island of Okinawa have other words that are actually proven concepts for happy longevity: ikigai, moai and hara hachi bu. If you are confused, I don’t blame you. But, ikigai, moai and hara hachi bu are more than Japanese words that are novel and fun for English speakers to say. These are powerful concepts that can help you have a more meaningful and long lasting retirement. Who Are the Okinawans and What Do They Know About Longevity? Okinawa is an island South of mainland Japan where the East China Sea meets the Pacific Ocean. It is a beautiful tropical place with some of the world’s longest living humans. On average, men live until 84 and women until 90. There are also a very high concentration of centenarians — people who are 100 or more. Most surprisingly perhaps is that even the oldest Okinawans are considered healthy and have the emotional, physical and intellectual capacity to live and function independently. So, what’s their secret? Researchers say that the Okinawan secrets include: ikigai, moai and hara hachi bu. Let’s find out what these intriguing words mean. Google translates ikigai from Japanese to English as “reason to live.” And, this is probably a good, if simple, description. Living a long life does seem to require having a sense of purpose well into old age. At least one international study found that people who have a sense of purpose in life are at lower risk of death and heart disease. Those who feel purpose often have healthier lifestyles. And, they are more motivated and resilient, which protects them from stress and burnout. So, how do you figure out your ikigai / reason to live? 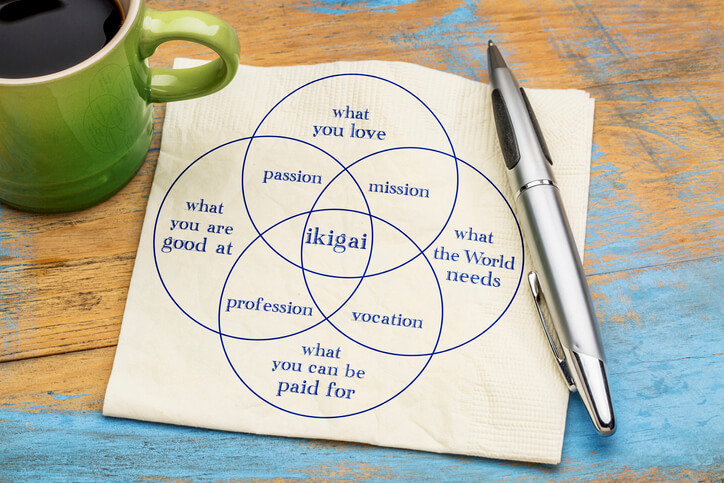 The Japanese construct of ikigai describes the intersection of what you love, what you are good at, what the world needs and what you can get paid for. It is challenging to you. Your ikigai should be something that you need to strive to master. Ikigai is your choice, not something foist upon you. In Japanese, moai refers to a group of lifelong friends. It also means a social support group that provides social, financial, health or spiritual interests. The concept of moai is being popularized in the United States by Dan Buettner, the founder of Blue Zones. Blue Zones is an organization devoted to helping people live longer, better lives by sharing the lessons of the longest-lived cultures. The term originated hundreds of years ago as a means of a village’s financial support system. Originally, moais were formed to pool the resources of an entire village for projects or public works. If an individual needed capital to buy land or take care of an emergency, the only way was to pool money locally. Today the idea has expanded to become more of a social support network, a cultural tradition for built-in companionship. In small neighborhoods across Okinawa, friends “meet for a common purpose” (sometimes daily and sometimes a couple days a week) to gossip, experience life, and to share advice and even financial assistance when needed. They call these groups their moai. Traditionally, groups of about five young children were paired together and it’s then that they made a commitment to each other for life. As their second family, they would meet regularly with their moai for both work and play and to pool resources. Some moais have lasted over 90 years! You might not be able to have a moai in the strictest translation, but you should strive to have a close knit set of friends and meet regularly. What is Hara Hachi Bu? Compared to ikigai and moai, hara hachi bu is super straightforward and relatively easy to apply to your life. Hara hachi bu is a dietary rule that says that you should eat until you are 80% full. By limiting your intake to near, but not quite saturation, you are consuming fewer calories, but not less than you actually need. You see, your brain is about 10-20 minutes behind your stomach. So, when you stop eating when you feel 80% full, you are actually full. Practicing hara hachi bu, the average Okinawan man consumes only 1,800 calories a day, compared to an average American who eats closer to 2,500 calories. Researchers believe that ikigai, moai and hara hachi bu are three big reasons the Okinawans live such long and healthy lives. Plant Based, Highly Varied Diet: The Okinawans eat way more vegetables than most people (mostly green and yellow ones), as well as whole grains, tofu, fish and other legumes. They eat very little sugar, and very little meat, dairy or eggs. The vegetarian diet is inherently full of anti-oxidants, flavonoids, fiber, nutrients and is naturally lower calorie and anti inflammatory. Activity: Staying active does not mean running 10 miles a day or sweating it out in the gym. The Okinawan idea of exercise is making physical activity a part of every day life. 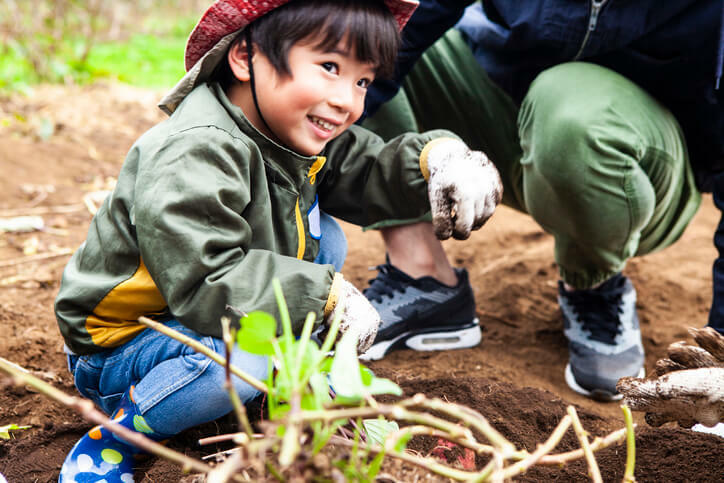 Almost all Okinawans are active walkers and gardeners. Gardening is a daily physical activity that encourages a wide range of mobility. Okinawans are also more apt to walk, ride bikes and even participate in martial arts. Furthermore, their homes have very limited furniture and they eat their meals sitting on tatami mats on the floor. Getting up and down from the ground increases flexibility and strength. Sunshine: Due to their tropical locale and active outdoor lifestyle, Okinawans benefit from year long exposure to vitamin D.
Outside Magazine recently asked, “Is Sunscreen the New Margarine?” It turns out that people with low levels of vitamin D — the hormone made by our skin with the help of sunlight — have significantly higher rates of almost every disease and disorder you can think of. And, vitamin D supplements simply don’t have the positive health effects as exposure to the sun itself. While skin cancer is a risk of sun exposure, it may be a lesser evil than lack of vitamin D.
Here are a few ideas for how to make a sunnier climate a retirement reality. You don’t know how long you will live, but the answer to this question can be an important aspect of planning for a secure future. In the NewRetirement Retirement Planner you can try out different life expectancies to see if your savings will last. However, it can also be a good idea to explore ways to have adequate lifetime income — income that lasts as long as you do — no matter how long that turns out to be. Lifetime income sources include Social Security and some pensions. You can also turn savings into guaranteed lifetime income through the purchase of a lifetime annuity. The NewRetirementPlanner has been named a best retirement calculator by the American Association of Individual Investors (AAII), Forbes Magazine, The Center for Retirement Research at Boston College, MoneyBoss, CanIRetireyet and many more. The tool is ideal for planning because it covers a comprehensive set of information relevant to retirement and lets you customize everything.